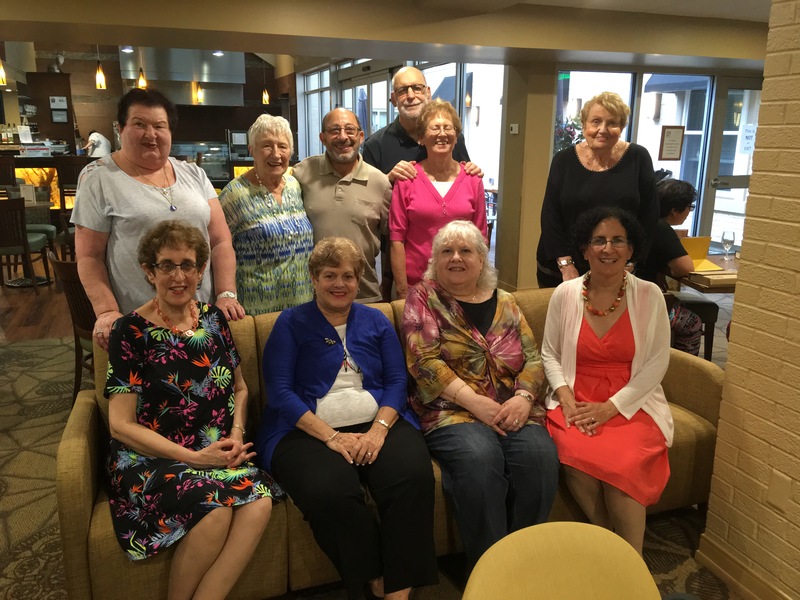 Hazak is USCJ’s program for people 55 and older who are members of our congregations. The name HAZAK is an acronym. The het stands for Hokhmah (wisdom), the zayin for Ziknah (maturity) and the kuph for Kadima (looking ahead). So Hazak notes that the senior represents cumulative knowledge, the ability to judge as zakeyn in a mature fashion, and has aspirations to move ahead during the decades remaining. With that in mind, Hazak is designed to address the needs of seniors in full-service congregations where programming priorities often are targeted to younger congregants. Cindy Goldstein, Membership Chairperson; and Marcia Mizruchi, Secretary. The Board Members are (standing) : Sondra Schwartz, Dolores Bluman, Lynn Cohen, Elaine Meltzer, Steve Meltzer, and Rita Shapiro. Not in photo: Ruth Borsky, Cecile Cohen, and Susan Miller.